Weighty Matters: When did fruit become a "trick"? Today's guest post comes from Dr. Sara Kirk. Sara brings with her a very broad perspective. She's got a PhD in nutrition and psychology from Leeds University, is a Canada Research Chair in Health Services Research, is an associate professor at Dalhousie's school of health administration, worked formerly as a dietitian and is a loving mom. Spending some time with her at the Obesity Society conference it became readily apparent that she had some thoughts she'd love to put out there and I happily offered up my blog. As you'll see, her thoughts fit right into this place and I hope she'll become a regular contributor. You can also find more from Sara on her research group ARCH's blog. Children across the country will be experiencing a collective sugar rush next week, culminating in the practice of “Trick or Treat” for Halloween. This has me pondering the meaning of a treat to today’s children and families. Halloween is a great example. 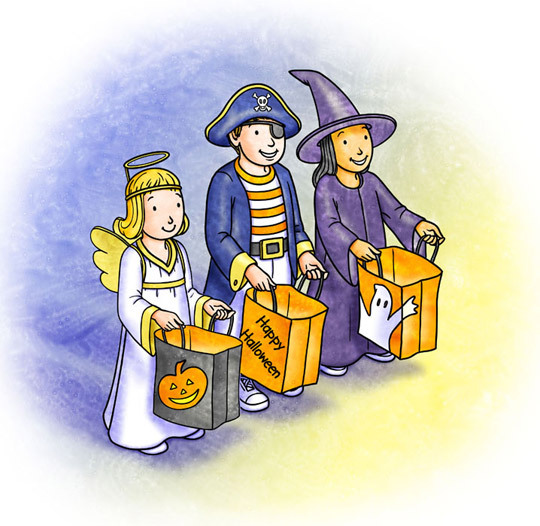 While the event itself takes place on one day of the year, the marketing machine that is the Halloween season, like other holidays or events, lasts for several weeks, with stores packed with jumbo bags of candy and chips. Then there are the various Halloween parties that take place – often through school and other organized events like Girl Guides and Scouts. No sooner is Halloween over than we start gearing up for Christmas, then Easter, and so it goes on. My definition of a treat when I was growing up was something that happened only occasionally, usually no more than once a week. For today’s children, I would argue that treats are now an everyday occurrence, contributing to the obesity epidemic through their ubiquity as part of the “obesogenic” environment in which we are immersed. At this point, the proponents of obesity as an issue of “personal responsibility” usually produce the argument that as a parent I should “just say no”. But when serving junk to children is not only the cultural norm, but also the biggest fund-raiser for many schools and other non-profits, how easy is it to buck the trend? I live in Nova Scotia, a province that is leading the country with its school food and nutrition policy. Yet, those who you would think have most invested in the health of their children, the parents, frequently undermine this policy, exposing my children to unhealthy foods with neither my knowledge nor my consent. For example, through bake sales, which happen every month in my children’s school as a way to raise funds. While the school food policy can enable teachers to ask that parents send healthy items to the bake sale, my children regularly report the availability of unhealthy items being sold, or raffle prizes comprising large amounts of candy (my son won a big bucketful in the first bake sale of the year). Then there's the annual Halloween party, run by the Parent-Teacher Organization, typically features sugary pop, chips, candy and popcorn for sale, while the class also has its own Halloween party with “treats” provided by the parents. This is repeated at Christmas, Easter and at the end of each term if there is no accompanying holiday to tie it into and through other regular events like the Spring Fair. Then there are the extra-curricular activities that children take part in. These included soccer and swimming for my children over the summer and I was shocked by the quantity of “treats” that parents brought to these environments. A typical “treat” comprised a pouch of kool-aid and a chocolate covered cookie or rice krispie treat – together these equated to around 250 calories, more than was burnt in the activity! Sadly my observations from the touchline, poolside and playground suggest that the power of food marketing to children and their parents remains a major contributor to the expanding girths of the nation’s children, active or otherwise. I am one of a few parents who send fruit with my children to these many events, but what a crazy world we live in when for many parents and children the fruit I send would be more commonly seen as the "trick" in lieu of the now normalized "treat".